Even the bar is filled with patrons on this busy Saturday night. 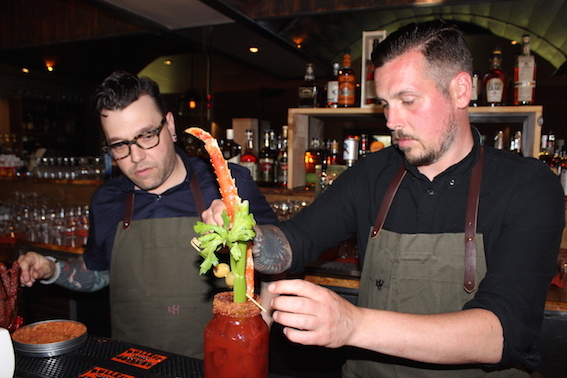 BAYFIELD – It’s Saturday night on the American long weekend and there’s a sense of anticipation at The Ashwood, this village’s newest hotel with bourbon bar and restaurant. 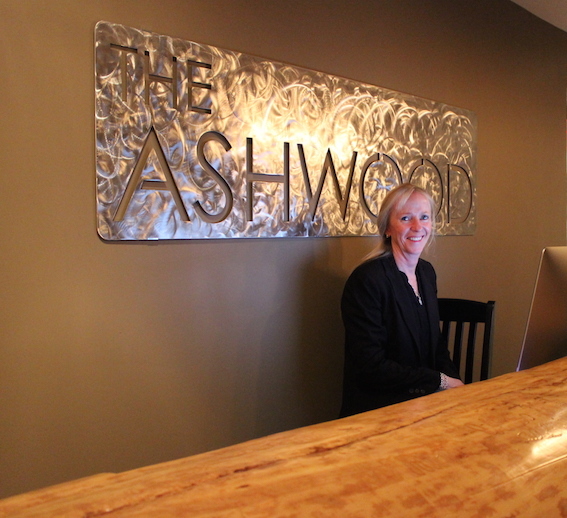 The Ashwood owner Kirsten Harrett at the front counter. on the website and social media – the massive tree trunk that serves as the lobby counter, living edge highly polished tables with leather placemats, barrel vault ceilings above the bar that are lined with oak staves held in place by metal straps, an expansive L-shaped bar with oodles of bottles filled with all sorts of exotic liquids, and wait staff in aprons of heavy canvas and leather straps. It’s all so new and intriguing and yet there’s something comfortably familiar about the bar. First, there’s owner Kirten Harrett who is greeting people this evening. She’s owned the Deer Park Lodge, just across the road, for a number of years, before purchasing the old Bayfield Village Inn and transforming it into its current state. There’s Peter Meades behind the bar, well-known for Meades Bros. Productions, which books entertainment at various venues in the village – and now he’s booked an eclectic lineup of Canadian and international artists with an emphasis on roots music and singer-songwriters for the bar. See what the summer season brings on its event listings. Some of the wait staff are the teenaged children of people we know. And, of course, there’s opportunity to stop at various tables to say hello to folks who haven’t been seen all winter long. Even before we enter the bar, we meet up with some friends who have spilled out of The Ashwoody Shuttle, its funky shuttle bus. The Ultimate Ashwood Caesar, with King crab leg, is a favourite. the routine. Tonight there’s a Mexican beef soup – I’ve forgotten it’s name, but I know that if I close my eyes while eating a mouthful of the spicy soup that’s topped with chopped avocado and sour cream, I am once again in Ajijic, Mexico. Also on the menu are: pan seared 10 oz New York steak with crispy fingerling potatoes, green beans and horseradish butter ($29), ratatouille with arancini and parmesan tuile ($18.50), lamb burger with sundried tomatoes and goat cheese, dressed with a tzatzki and tomato jam, served with chick pea fries ($16), trout with roasted fennel and tomato purée served with wilted spinach and a panzanella salad ($22). 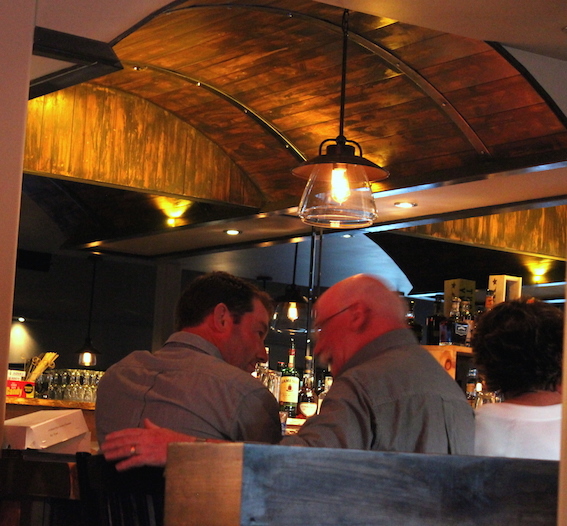 It’s a wise decision on the chef’s part to create a small menu, and our service is seamless. Water glasses are always full and drinks are efficiently replaced. My lamb burger special ordered with no bun did indeed arrive bunless and, as requested, my glass of red wine arrived with the meal. I would dearly have loved to have ordered the Ultimate Ashwood Caesar, which comes with a King crab leg, or the Don Draper ($14), a mixture of double Makers Mark, bourbon soaked cherries, giant ice cubes and a Popeye smoke, but alas, I’m driving. By the time we’re offered dessert, there’s only one taker for the bread pudding with a bourbon caramel sauce ($9), although the spoon does get passed around, with agreement that the sauce is just a bit too boozy. 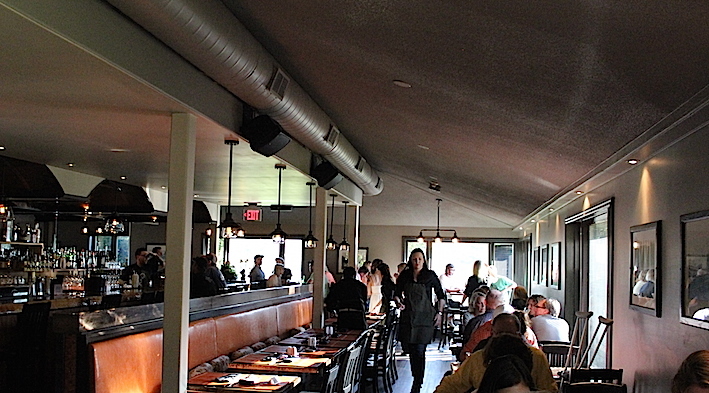 When we leave, the place is full, with a long table of people who are filling time between a wedding and its reception, Americans on vacation, and locals who’ve come to check out the newest hotspot in Bayfield. It’s shaping up to be a great summer in the village. The high ceilings and line of windows give the bar an airy feel.